Macworld 2008 is now over. The AJAX Feed and SMS Updater where a large success, we saw over 1 million hits to the server (about 10,000 unique visits during the Keynote). TheiLife can’t wait for Macworld 2009, which will be taking place January 5th-9th, 2009- see you then! Wow! TheiLife.com has all the suddenly taken off! We are averaging almost 300 unique visits a day, which for a site that is not even two months old- is great! We love to see people enjoying what we create. With that said, things are going to be changing in the coming weeks. We have a host of tutorials, articles, podcasts, reviews coming your way in the very near future. Also, we are working extensively on Macworld, while trying to do everything else at the same time. This explains the general lack of content this week (compared to last). We hope you understand that we have our hands full, and over the coming weeks there will be lots of great stuff ready for mass consumption. 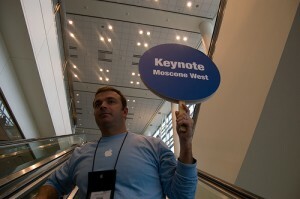 Macworld 2008 – Update I! 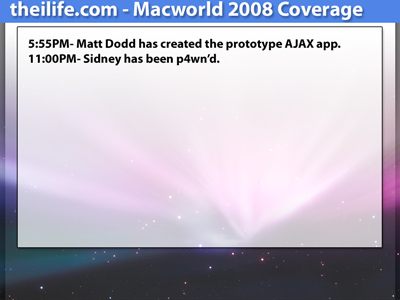 Just as I promised, Sidney and I have been working on the AJAX application. We have come to terms (for now) with the design, and have began to *start* coding. This part of the process will probably be the most time consuming, so hang on tight- there should be more to come in about a week or so. After the continued success of the iPod in 2005, the Apple community was running wild with the concept of the iPod ‘Halo Effect’. The iPod ‘Halo Effect’ was an idea that with Apple’s success in the iPod product line, Windows users would be more inclined to buy other Apple products- mainly their computers. 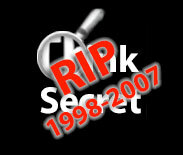 From Macworld to Piper Jaffray and Morgan Stanley, everyone was abuzz with the idea, some even tried to predict numbers. As time passed, we began to stop hearing about the iPod ‘Halo Effect’ that is, by that name. Since 2005, Apple has surpassed the 100 million iPods sold and has seen significant increase in sales, seeing its worldwide market share rise to 3.2. Apple is predicted and on track to set a record high Holiday Season sales of both iPods and Macs. So what is behind this recent surge? The iPod ‘Halo Effect’?! The answer is actually Windows Vista. Almost 6 years in the making, Windows Vista is keeping PC users from upgrading from XP. Criticized by some for its compatibility issues, bloated code and demanding system requirements, Vista has been met with loads of negative press by the PC community. Meanwhile, within this time, Mac users have seen 5 upgrades to OS X and the switch to Intel processors. Recently Apple released its latest iteration of OS X this October with Leopard. Mac OS X Leopard has brought significant improvements to OS X, and has been met with both strong praises and sales, selling 20% more copies in one month than Tiger did. This coupled with competitive Laptop and Desktop hardware offerings has compelled some to make the switch. Keep tuned for Part II. We are proud to officially announce our new podcast, generically dubbed (for the moment) “TheiLife Podcast”. You may have already seen Episode #1, “The Introduction”, yesterday, but I promise there will be more coming later this week. We have also opened a podcast page, located here (and in the nav bar above). It is similar to our videos page, but no categories and only contains our Podcasts. We also have moved from ThickBox to LightWindow for our lightboxing needs! Wahoo! We had to change our old lightbox because sometime over the weekend (while Sidney was working on our code’s w3c compliance), our old lightbox decided to act up on us! It stopped loading content in all browsers except Safari! Sidney spent most of the day trying to fix that fricking lightbox. So, out with the old, in with the new — everything is just about back to normal now (and a little prettier, to boot)! Just don’t try and use it with Internet Explorer. Don’t worry though, we will fix it… how evil do you think we are?! (seriously, though, it’s a known bug in either LightWindow or Internet Explorer, depending on whom you ask). Sorry for the lack of content today, besides the fact it was a slow news day, we had a lot of bug squashing and code tidying to do! As usual, though, feel free to report issues with the site to webmaster@theilife.com or in the story comments. We have spent an extensive amount of time over the past few days recording video podcasts. Keep on the lookout for some heading your way throughout the coming weeks! Below, enjoy a video introduction to the site and content to come. An unnoticed issue in our recording system caused corruption of the audio coming in from the mixer. We fell back to in-camera audio (which doesn’t sound all that bad), but note that we do actually have a quite nice sound setup.